As I have mentioned on other topics, our last daughter married in September, leaving us empty nesters. 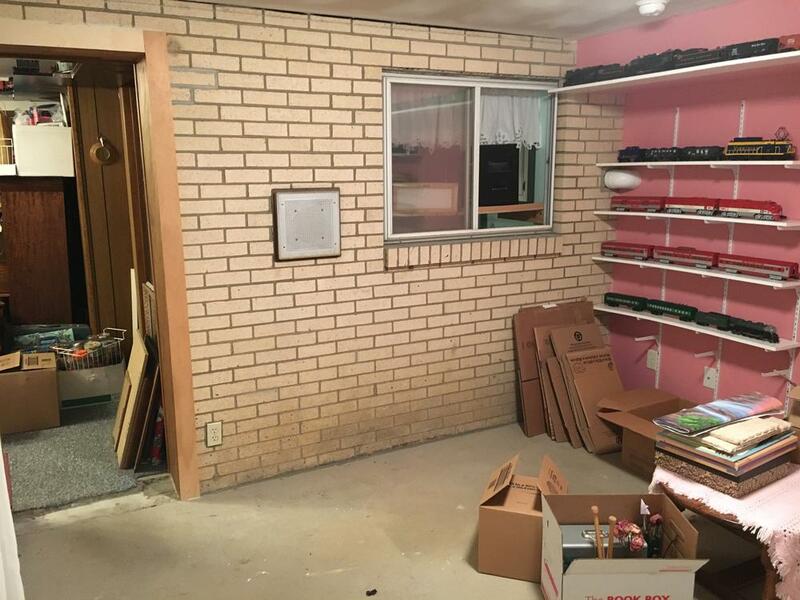 Just a week ago, I helped her and our son-in-law move the rest of her things out of an 11’ 6” x 11’ 4” basement room she had been using as an art studio. This will be my layout room. 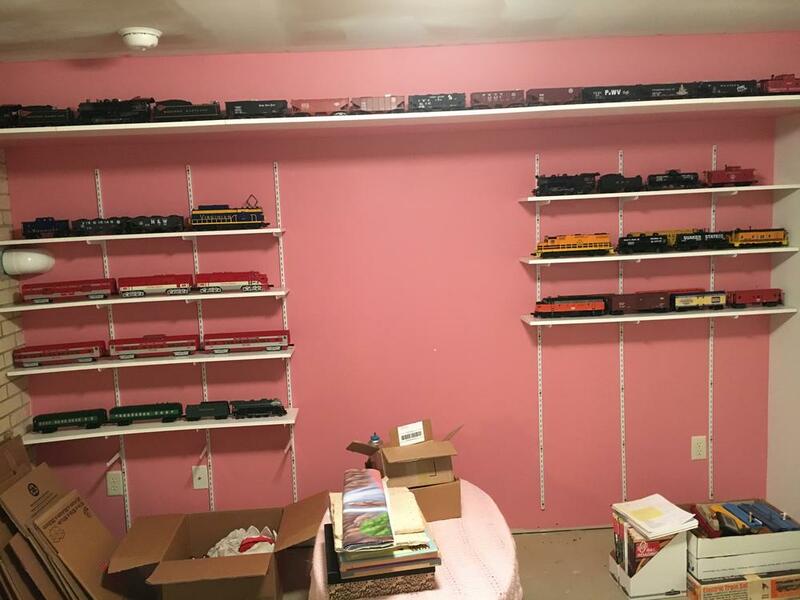 While I have built layouts in HO and N scales, this will be my first in O gauge, not counting the temporary 4x8 temporary layout that has our Christmas theme and my Ceiling Central RR in a similarly sized room diagonal to the new layout room. I have hesitated starting a topic of my own layout design as I have been struggling getting some thoughts down on what I am looking to accomplish and realistically look at obstacles and how to address them. 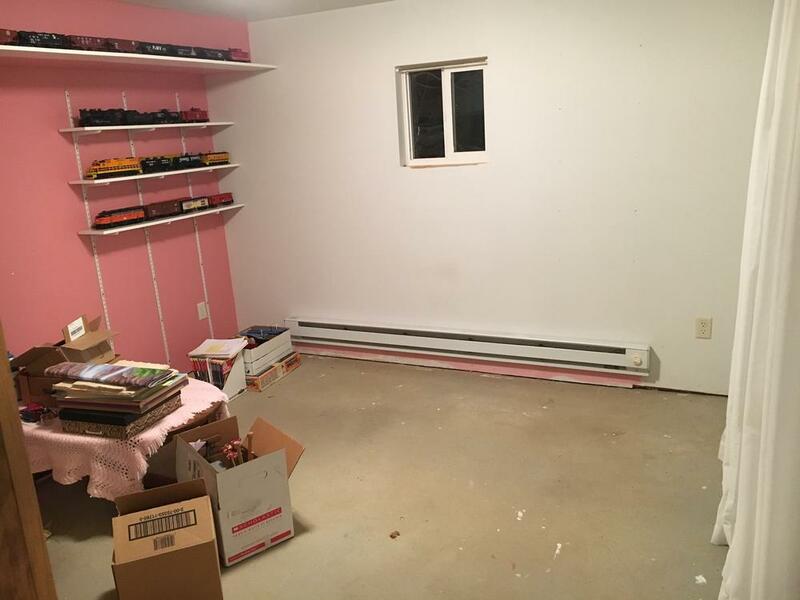 First, this is the most room I have ever had for a layout since my first back when I was about 12, but I never built in O gauge, so there are definite restrictions. An area of operating accessories for future grandchildren which could be at a lower level than the rest of the track. There are more I will add as they come to mind or as you ask questions. Some thoughts on how to accomplish this in such a small space. As the preliminary SCARM diagram shows. There is a sliding glass door on the right-hand wall as you enter the door from the rest of the basement. I need to keep full access to it. My thoughts have been a ‘U’ shaped layout with the open end of the ‘U’ facing the door. There are 2 windows as well. 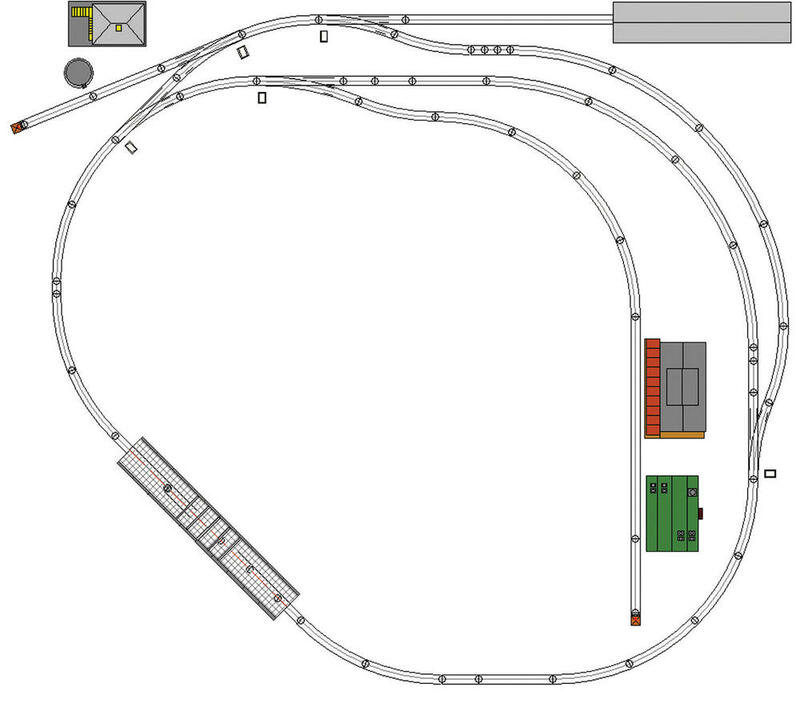 I do not want to be stretching across the layout, but may have to have turnback loops at the ends of the ‘U’. To accommodate my Premier N&W J 611, Weaver Gold Edition B&O Cincinnatian, and their consists, I think I would have to include a loop around the room. My thoughts have been to put that at the highest level, with lift-out bridges at the opening of the ‘U’. These are initial thoughts that have been with me for a good while. It is time to put them out there for anyone who wishes to participate to ask questions, give suggestions, or just chat in general. At the outset, I want to thank everyone who contributes in any way. I want to get this close to what works best for me, because I do not want to count on doing heavy rebuilding at a later age. At 60, I realize I could be hampered in the heavier construction sooner than I would hope. 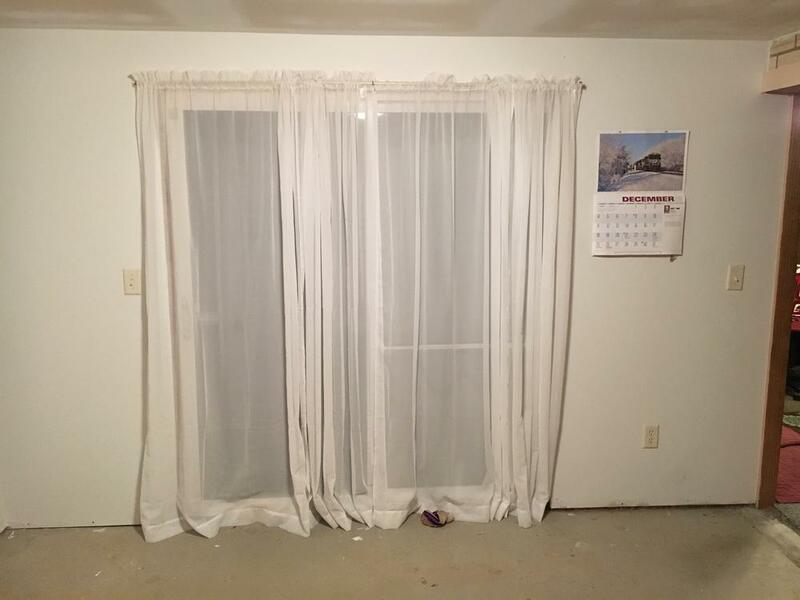 Here are photos of the room. Yes the pink wall will be the first thing to go. Nice Mark, Looking forward to pic updates. I would be careful though with that wall heater, and would keep layout legs and boxes at a safe distance. From your description, it seems that you have an ambitious plan ahead. What type of track are you planning to use? If you decide to go with tubular, I may be able to help you with some pieces, turn-outs and miscellaneous stuff. Also, when it come time for construction, and you need help, I would be happy to be of service. I've got lots of tools and love to build stuff. I don't know what the minimum curve radius is for your Weaver cars, but I would suggest a single-track "hi-line" on fills and trestles like the P&WV/N&W as an O-72 or O-54 loop around the back of the layout (along the walls) with a siding to run your passenger trains and a through freight. To make the trains seem like they're going somewhere, make a backdrop that conceals a small 3 or 4 track staging yard. Maybe disguise the end of the backdrop with tunnels. Below the grade of the hi-line, you can have a point-to-point coal mine and timber road that interchanges with your hi-line. The coal road would probably have a maximum radius of O-42, and weave beneath the hi-line. If I have a free day later this week, I'll try to mock it up on SCARM. Also, if you need any help, let me know, and I'll see if I can find some time on a weekend. That is for sure Joe! We actually never turned it on the whole time our daughter had her studio. The house we had when the girls were toddlers had them, I found a stuffed animal next to one and it's fur was scorched. I have a convection heater for the coldest weather. I certainly like the way you are thinking! The P&WV/N&W is an example I did not think of, since I am more familiar with railroads to the North. That would call for some cool trestles indeed! I will have to search for some photos. I agree, the Weaver cars say they will take O54, but recommend O72. They work on O54, but I have tried everything on O72 on the patio, and that is defiantly better. One thing that helps viewing is being inside the curve instead of outside. Yes, O42 would work for the coal road, weaving under the high line. I have an MTH Premier H9 consolidation, a Premier 0-8-0 switcher, K-Line Pennsy A5, some F3 and F7 sets, 2 RS1 units; all scale. I like 2-bay hoppers, shorter log cars, and 40-foot boxcars. My rebuild is going to be a similar size, roughly12-1/12 x 11=1/2 along with a complete redo of the basement into and I hate this word, "mancave". I was originally planning a full blown take no prisoners layout but since I need to isolate the trains from our cats a sealed off train room was the way to go. It's tough tho having a blank canvas and a million ideas, I wish you luck and look forward to what you come up with. For your main line I would definitely go with 072 curves. If you use any tubular track I have a big box of almost new in the attic that is yours to use. The first thing I would do is tunnel through the wall in to the basement !! My layout is about 11 1/2 ft square so space is at a premium. I would use backdrops and false front buildings. accessories are neat but take up a lot of room. I have a big opening in the middle for access, would love to use the space but the access is too nice to lose. Do you plan point to point, loops or both ?? Hey Jerry! I don't like the term 'man cave' either! Walk out basement to the patio isn't really a cave anyway! I know I have more ideas than room. Thank you, and good luck to you too! Thank you! This room was part of an addition my in-laws put on so there is a brick and block wall to the next room. My wife made a suggestion that I go through the door into the family room and connect onto the Ceiling Central RR, which was also her suggestion. I thought it wouldn't work because everyone would hit their head, but looking or it, I could put a bridge in the upper right corner of the door and connect on. If so, I would have to get a track up very high in the new room. The other side of the brick wall window is the laundry area, and it won't work to run tracks out there. i would like to do a loop to loop to make it look like the trains are returning, but may end up settling for loops only. I think your plan is already a lot better than I could come up with. I am not much of a track planner, others here are much much better. I have been fiddling with an addition to my layout for about 1.5 years now and I don't think I am any closer than when I started. I think you have a much better idea of what you want as well. I also struggle with that part. Anyway, I wish you luck and I will be following along. The other side of the brick wall window is the laundry area, and it won't work to run tracks out there. The first thing I thought was take it through the window and then I read it was your laundry room. Could you take it right out the window and right back into the room? It may give you more room for accessories. I like the idea of the larger curves on the bottom line and sharper curves on the second level. Ever think about a point-to-point option for a third line? The washer, dryer, and stationary tub are right beyond the window, and that is all the wider the room is. Yes, I could go out about a foot and a half at the most, as I already have a shelf there where I mounted the convection heater for my daughter when she used the room for an art studio. Point to point third line? I have thought a third line may be something at a low level where kids could run less expensive trains. I have also thought of getting a Shay or Heisler someday to go into the mountains for logging. Point to point could work for that. Good point to bring up!! Thank you! Good to see the creative juices are flowing Mark. I would recommend that if you want to add operating accessories, figure out where they will go first. They take up a lot more space than you think. I like the multiple lines also. Gives you a place to showcase your collection and someplace to "play". A point to point with industries may be a good way to include the accessories you want. Maybe add a by-pass siding or two on the main lines so that you can have multiple trains ready to go. I know this design is very preliminary and I assume you know, but I thought I'd mention it just in case, that your lower level track is set to a height of 2.99" and the upper level to 6.1". Obviously, this will not work. You also have your upper level track crossing over itself on the curves in the lower left section. Do you intend to have an over/under grade there or a crossing? The over/under on supports might be a challenge, but if your intent was a crossing, I don't believe Ross makes a curved one and the standard straight ones will change the upper level geometry. You mentioned using GarGraves track with Ross switches. You're currently using GG switches, so I thought I'd also mention that the footprint of the Ross switches is quite different. I added a Ross O54 just to show you the difference in size. I used the GG O54 you had and didn't play with O42 or O72. I hope you don't mind, but I also played around a bit to see what an over/under would look like on the upper level and added a crossover to the lower level because it looked like you were leaning in that direction. I wasn't sure of the layout size inside the room, so I just used 138x115. I look forward to seeing where this goes. USAF E-9 (Ret) Aim High! Check this out - The Spare Room and Pacific RR it has a lot of your druthers and leaves people space when you enter the room. O54 & O72. Great to hear you are able to build this, Mark. Good luck!! I am not very experienced in layout design, I have changed my loops more than once but I find threads on designing pretty interesting. Not too many are prototypical but they are model RRs built, usually, in a lilited space. I do find the MTH layout in Moonman's post interesting. You seem to have a lot in mind in what will be a limited space. Logging and a mine, even a representation of those functions will take up a great deal of space. Think long and hard about what is the most appealing and build that out. This type of space lends itself to the small details. A well detailed mine or logging operation but probably not both would be fun to build. I agree with the person above about having a hidden staging track(s). The train could leave and be replaced by something else. Having the train leave your sightline automatically gives the appearance of a much larger space. I would look at other sources for ideas like the online magazine Model Railroad Hobbyist or back issues of Model Railroad Planning for ideas. Even though those sources tend to favor HO, many of the ideas can be scaled up to O with some editing. And if you have to have a logging operation consider a separate line using Bachman 0n30 equipment. Terrific looking stuff but it may be a better fit in the available space. The MTH 45-1105 Spare Room & Pacific in your room. Bob, Thank you for the comment about the operating accessories. I have a few I picked up when I saw them at good prices, took them out of the boxes for a look see, and then boxed them up again. Now that I have the room free, I need to get them out and just set them around to see how much room they and key static structures I have collected will take. It is a good Idea, as I can then mark squares on the plan where they will go. Thank you. Dave and Carl, I will comment separably to your suggestions. Mike, Thank you for the well wishes on the new layout! I am glad to see you are working the kinks out of your plan as well. I guess you got the major projects on the new house under control, so this winter is to start the layout. Good luck on yours too. I hope to run into you again soon. I enjoyed talking with you at Patrick H's. Jim, Thank you on the offer on the track. Yes, I found the plan Carl posted interesting, and maybe a good starting point. NECRails, I agree, I just don't have the space to have models of both logging areas and coal mines at all. I think I will have to select one, then just run through trains of the other. I was in HO for many years before switching to O gauge about 5 years ago. I have read up on the staging concept quite a bit, attempted it on a very small layout, and think it would be good to try to incorporate. I recently had a thought that may be a useful way to incorporate the Ceiling Central RR from the other room. Rail height is 81" above the floor. That is 2" above the top of the door jam, so If I ramped down about 7", I could get trains into the new layout room. I actually bought a Bachmann On30 engine and 3 or 4 cars to see if I liked bigger scales. Once I got into O 3-rail, I sold them to a friend; but I could certainly buy another one and fit it into a 3-rail layout. Your assumptions were all correct! You had me figured from past conversations. As far as the elevations, I tried to change them, but never figured it out. I don't even know where I'm starting yet. You were also correct about the upper loops, I was thinking of running them over and under as you did. I didn't even know if the grades would be practical in that room, but thought the only way to find out was to try it in SCARM. I was not aware Ross switches had different dimensions than GarGraves. Thank you!! So, what you shared is just what I had in mind for a starting point. Of course, the upper level may only work as a once around with no grades, and I was thinking of sidings or a little yard for the accessories, but they can be added. You gave me a great starting point!! I did not even know that that MTH had 45-xxxx track plans, bills of materials out there on their site. Thank you! Yes, this plan is a good example of a starting point I had in mind for one level. I will have to examine it more closely! You are most correct about leaving people space. I want to share the layout with others, of course only a small number at a time. Also, at 60 years of age, I want to make it easy on me as I age to work with, add to, and maintain. I need to keep in mind not to try to cram too much into the space. Thank you on a reality check!! Your assumptions were all correct!................... You gave me a great starting point!! Here's the SCARM file if you want to mess with it. Mark: Maybe you should keep the pink walls? Those are kind of cool! You have some real good specific ideas. That's a good start. One thing you can do to create the illusion that the trains are going somewhere is to have staging drawers under your layout. No one, not even folks with basements have enough storage space. A guy I know buys those plastic clear containers from Walmart that slide in and out like a small dresser. Those would be ideal for extra storage. I see you want to run passenger cars. Since you aren't holding true to an area, purchase the early 1900s small passenger coaches and pull with an 0-4-0 steamer! MTH just recently came out with an 0-4-0 and it will look great in a smaller area. I would recommend buying the under-sized (traditional) stuff, because the smaller stuff will look better on smaller curves. Even if you get full-scale "O" stuff, but the smaller pieces of equipment. Be sure to check out the MTH 44 ton switcher. It looks awesome and is small even in full size "O." Please send me the exact dimensions for your room. Put in ALL obstructions including doors, windows, there size and hieight off floor for base of window etc. If there is any other obstruction, be sure to tell me. Usually, I would charge for detailed track design, but for you it's a freebie. You can come up with some really cool stuff in small spaces. Mark , Finally getting to this... Plan is interesting but so are the ideas everyone else has chimed in with. The MTH plan could be expanded with modification. Either way looking forward to seeing this build as I know you have waited a long time for this. I just cant help but think that you married her off so you can have a train room... . Thank you very much! It looks so much cleaner than the attempt I attached! Thank you Doug for the encouragement!! How did you guess?? Actually it took him almost 9 years to pop the question! We thought he never would!! Let me guess an offer he couldn't refuse? Well glad he finally got the courage. You never struck me to be the scary dad type. Another mention of the MTH 44-ton unit! I have had several folks suggest it. Maybe I should. The Western Maryland one would be my pick! :-) I have liked the loads in empties out idea for a long time. Thank you for the offer. I will send dimensions. Mark....good luck.....you have the correct approach......go slow and think it through. Mark: After re-reading your Post much more closely today, I have some thoughts to share with you to consider. It sounds like you want four layouts in that space: a logging line, a coal line, an operating layout at a lower level for future grandchildren and a layout loop big enough to accommodate your larger engines and passenger trains. That will be a challenge to accomplish well. Further, you wrote that you have another room which has your Ceiling Central RR and a "temporary" Christmas themed layout. FIRST, I would, if it isn't already possible, make your ceiling central RR able to accommodate your Premier N&W J 611, Weaver Gold Edition B&O Cincinnatian, and their consists. Those trains are "too big" for a 12 x 12 room. I mean yes you can make them work, but their size will compromise the scenery/display integrity. In a smaller area, it is a great idea to either use undersized O stuff or small full-sized stuff. MTH has that 44 tonner and an 0-4-0 both Premier Line that are full-size but could be used effectively on the smallest layouts. They are both awesome! SECOND: I would make your "temporary" Christmas themed layout into a toy train layout featuring accessories for future grandkids. The reality is: the layout you build for YOU is going to be entirely different than for small children. I don't know what your temporary is constructed on, but build one on a two-inch thick foam 8 by 4 sheet. These foam sheets are light as a feather and simple to move. You could construct a simple layout or figure 8 on this sheet and place the operating accessories on it. It could be on the floor for the smaller ones to play with. WHAT I DO WHEN SMALL KIDS ARE COMING is break out the loop of Lionel Fastrak and lay it on my foam sheet, which I lay on top of my pool table and the kids can play with it to their hearts content. I use the tougher, harder-to-break engines and cars. THIRD: DESIGN a layout for YOU and other adults that would be your coal carrier and logging line in the Appalachian Mountains in YOUR room. I'm kind of torn, and its entirely up to you anyway, of whether or NOT to make this one railroad or two--the same layout in the same place. Many people for logging lines use the On3 stuff (O scale that runs on HO track). The engines are specialty shays, climaxes, etc., engines that were specifically made for steep grades. It might be neat to have a separate logging line. It could even pass through the same scenery or you could make two levels in that room: one for the logging and the other for the coal hauler. You'll have to think about that and let me know. FOURTH: If you go with having the coal and logs as ONE line and that may be the best, there are several possibilities that don't include reversing loops at each end of the line. It may be difficult to put into words what I'm attempting to describe but you may have "u" shape around the outer walls of the room. Near the "tips" (Ends) of the "U" there would be an adjacent siding about four feet long. Your consists would need to be very short, 3 to 4 cars total including caboose, and a short engine. The engine would uncouple from these cars immediately at a track switch (turnout) and pull forward through the switch. You would "throw" the switch and back the engine onto the adjacent siding rolling past the consists that it just uncoupled from. The engine would go to the next turnout, where it would reverse again and couple onto the rear of the train it just uncoupled from at the start of this sequence for the return trip home. There would be a similar arrangement of track-work on the opposite side of your "U" and this process would be repeated again. One side would be your loading side. The other side would be your unloading place. You could have staging drawers under the layout to swap out empties and loads. I would consider buying an 0-4-0 and 44 tonner for YOUR space. It would be fun to switch around coal and logs in this arrangement. In my mind, I picture a very old time town stationed in the mountains. Given your space constraints, it would be idea to have the town painted onto the backdrops with the mountains looming right behind. It would be neat to extend your scenery over the front edge of your layout and have the backdrops rise completely to the ceiling. I have been thinking of a "stacking" arrangement for you as well where both of your reversing loops at the "ends" of your run would be over/under each other to maximize your space. There would be access to clean/build/maintain in the center of these probably 36 diameter bubbles if you go this route. DO YOU HAVE THE SKILL to build a lift out or hinged section across your sliding glass doors that can EASILY be moved for access/egress? I'm going to await your response...if you want to call me and discuss this in more detail I can private message you my number. YOU ARE GOING TO HAVE TO DECIDE HOW MANY LAYOUTS YOU WANT IN THAT SPACE. :-) I want everything too and it just can't be done well. God knows I've tried. OK, Mark, I am going to jump in with MY track plan for a layout. My layout is the same size as your room so it makes it easy to visualize. Since I am illiterate with computers, I am going to draw it by hand-to scale- and send you a digital image. This will be a general main line plan with room for secondary lines and branches. it can be run as a looop or two or point to point plus some could be elevated. Jim P.
After reading a comment from your about the 44 tonner Western Maryland switcher I began searching some history. CHECK THIS OUT! I have a great idea for you! The West Virginia Central and Pittsburg Railway (WVC&P) was a railroad in West Virginia and Maryland operating in the late 19th and early 20th centuries. It had main lines radiating from Elkins, West Virginia in four principal directions: north to Cumberland, Maryland; west to Belington, WV; south to Huttonsville, WV; and east to Durbin, WV. Some of the routes were constructed through subsidiary companies, the Piedmont and Cumberland Railway and the Coal and Iron Railway. The West Virginia Central and Pittsburg Railway (WVC&P) began as a narrow gauge line in 1880, its name and gauge changed in 1881 and in the ensuing years it opened a huge swath of timber and coal territory in the Allegheny Highlands of West Virginia. The railroad was directly responsible for the creation of such towns as Davis, Thomas, and Parsons. In the large valley near the mouth of Leading Creek and the Tygart Valley River, the WVC&P constructed the city of Elkins (named after investor Stephen Benton Elkins). Elkins was home to a large rail yard for the railroad and served as the hub of Western Maryland and Chessie System operations in the region well into the 1980s. The WVC&P was sold to the Fuller Syndicate in 1902 and was merged into the Western Maryland in 1905. Known as the Thomas Subdivision, the line connected to the Western Maryland mainline at Maryland Junction, south of Cumberland. This line, famous for its Black Water Grade in Blackwater Canyon, became an important part of the Western Maryland's success until its eventual abandonment in the 1970s. This railroad became the Western Maryland in 1905. The Canyon extends from the foot of Blackwater Falls, near the town of Davis, to the confluence of the Blackwater River with Dry Fork (forming the Black Fork), near the town of Hendricks. Location: West Virgina from small town of Davis (visible) to town (unmodeled) of Hendricks through Blackwater Canyon. Passing thru canyon across curved stone arched bridges! That would be cool! COMMODITIES: LOGS and Coal! What else? ERA: varies, but earlier days (1900s) are better because of smaller engines and consists will make a model appear LARGER. PURPOSE? To haul coal and logs to their destination thru Blackwater Canyon! PARTICIPATION: with a point-to-point style absolutely. Design for minimally two Operators may keep commodities moving along this line, which would include steep grades and sharper curvature; EVEN IN REAL LIFE. Mark: for what you were envisioning THIS RAILROAD IS AN IDEAL FIT! Use this railroad as a "model" and source for information. Don't try to duplicate it. Just try to develop your Design to be "in tune" with this. I was looking at pictures of the canyon, river and area--even the town of Davis which is still a bump today, 600+ people. You would have a fantastic idea by viewing pictures and gathering other info. about what this area looks like and what was actually there. This theme would make for an awesome model of a railroad! Have you thought about a walk in layout using a wrap around 054 dogbone open at the entrance at say 40" with second loop with a bridge across the opening at say 48-52"? This would be an around the wall design that would put you and your observes in the middle of the action. I would hesitate using curves smaller than 054. Mark - Its great that you are building this railroad!! I look forward to seeing photos of your progress as your project evolves. There's nothing like a blank canvas to inspire ideas. I do agree with you and Jerry that having all these ideas bubbling up at once can be overwhelming and at the same time can be very enjoyable because, at least for me, its like being a kid again letting our imagines roam as if there are no limits. Enjoy your process to the max! I'm very happy for you!! Jerry - I also agree with you and Mark about the term " man cave". Since my layout is up on the second floor I sort of have a "man loft"
Good luck Mark! I am interested in watching this layout unfold. I will hopefully have a similar project in my attic in the next few years. I probably need to get some grass and landscaping first! Aircraft for work, trains for fun. First of all I am happy to see that your finally able to start a layout of your own! Now, after looking at your room pictures, if you can't take out that window (The one in the brick wall) and continue the layout into the next room , then I think a multi level design will be the best bet. I have a old book, my father in law works at a library so he finds me a lot of older material, but it shows multi level design layouts, very cool in my opinion. Let me know if you want to take a look at it, I'll figure out a way to get it to you. With a design like that you could have three levels, separated, all with different themes, and be able to run several trains. I haven't worked with SCARM in awhile but I'll see what I can muster up, probably better if I just drew it on paper, LOL.